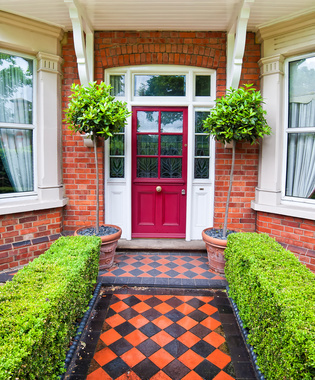 Fresh coats of exterior door paint colors can make your entryway pop and will improve your curb appeal. Depending on your region's climate and your door's exposure to the elements, there are a variety of paint options to consider. Read on to learn more about exterior door paints. Homeowners who are looking for a bold entryway may want to consider exterior door paint colors in deep red, such as cinnabar. This gorgeous color will look elegant paired with a brass kickplate. For a jolt of playful energy, try a light yellow. Different regions of the country may also call for different exterior door paint colors. For stone houses in the mountains, try a muted color such as a deep blue. For homes in the southwest, especially homes in the Spanish Colonial style, try a cool sea or mint green. For coastal living, try a rich blue-green for a watery, tropical feel. Homeowners should plan to pay $35 to $45 per gallon for conventional paint or stain. “Green,” or zero-VOC, products tend to be more expensive, costing $45 to $55 per gallon. A single gallon of paint or finish usually covers around 350 square feet and is more than enough for a single exterior door, or even two. However, keep in mind that most paint jobs will require a primer and two topcoats for best results. While there are many product names and exterior door paint colors that homeowners can choose from, the two primary types of paint are acrylic latex and oil-based paints. With high-quality brands and regular maintenance, homeowners can extend their paint job's lifespan and minimize the need to repaint your door later on. Acrylic latex is a popular choice across the board for exterior door paint colors. Its semi-gloss or gloss finish provides the most protection and works well on high-use areas like doors. Since acrylic latex also remains flexible after drying, the paint is able to breathe and will adjust to accommodate changes in temperature without cracking. Oil-based paints harden after drying and will only continue to grow harder over time. They are an attractive, durable choice for doors made from fiberglass that are less susceptible to warping from changes in temperature. Homeowners should still be aware that oil-based paints are more likely to crack than latex paint. Homeowners should take note of the paint type already on their door, as new acrylic latex doesn't bond well with preexisting oil-based paints, and vice versa. Unless you are willing to thoroughly prepare for a different type of paint by completely stripping off the old paint before starting, it's advised to stick to the type of paint first used on your doors. When using latex or oil-based paints, expect paint fumes to linger until the paint dries completely. These odors are produced by volatile organic compounds (VOC), which contribute to air pollution and are toxic in large quantities. Homeowners can, however, purchase special zero-VOC paints, which have all the benefits of latex or oil without the toxicity and smell. A paint job done correctly can last up to ten years. Whether you're starting anew with a different color, or simply looking to give your door's old color a fresh coat, it's always good to know your options before you start shopping.